She's more or less family. In a palatial Chilean estate owned by a large upper-class family, the windows are covered with bars to protect the haves from the have-nots. The home is also surrounded by a gate to further isolate and protect the copious clan. The frequent imagery is fitting considering that--for the last 23 years--the estate has served as a prison for maid Raquel, the central figure in this refreshingly unpredictable indie. But is it a prison she wants to escape? Can both ends of the societal class system co-exist in harmony? 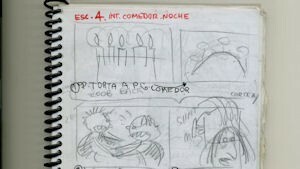 Those are the million-peso questions in the second feature film from director Sebastián Silva. 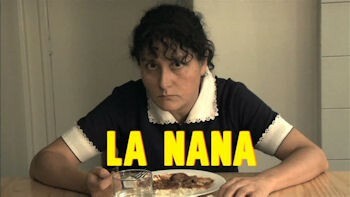 The Maid (La nana) has amassed quite an impressive resume on the award circuit, with a bevy of nominations and wins since 2009--including two jury prizes at the Sundance Film Festival. All of those accolades are well-deserved, and the young Silva undoubtedly has a great career ahead of him. 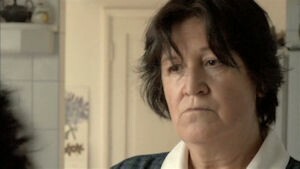 Hopefully too does fellow Chilean Catalina Saavedra, whose quietly unsettling performance draws you in from the opening shot--where she practically breaks the fourth wall as she stares at us, too tired and defeated to beg for our sympathy or help. It's two of the most powerful opening minutes I have ever seen in any film, immediately setting the stage and getting us up to date on a lifelong history--but with very few words. It gives us all we need to know about the dynamic that drives the film: As Raquel settles down for a quiet dinner, the raucous sounds of the six family members--enjoying a big meal in the big dining room--pierce her ears like a never-ending dog whistle: "I'm not going to clean up after something I didn't do!" yells one child; "Mom, I want a Playstation 3!" demands another. Welcome to the tragic routine of Raquel's life. Then again, you get the sense she's almost immune to the noise--and there's a lot of it. Camila (Andrea García-Huidobro) is the eldest of four siblings, and the one who clashes the most with the maid ("Raquel hates me," she tells mom. "She's always hated me. I'm sick of it!"). Their silent war plays out with passive-aggressive panache: "Raquel, we're going to study all night long," Camilla says as her schoolmate arrives. "So please don't vacuum near my room too early." (Silva wrote these wonderful nuggets along with Pedro Peirano.) Then there are the two young boys, Tomas (Darok Orellana) and Gabriel (Sebastián La Rivera), who demand the most of Raquel's physical energy. Thankfully, eldest son Lucas (Agustín Silva) is there to charm everyone (when he isn't letting his hormones get the best of him), his antics occasionally forcing a smile from the perpetually deadpan Raquel. He's her favorite, and the whole family knows it. Pilar: "I forbid you to do the dishes now!" Raquel: "If I don't do them now, I'll still have to do them later." Pilar: "...fine. Let's clear the table." The family seems to have worn down the 41-year-old woman, whose increasingly intense headaches and overall fatigue have started to hamper her performance. But despite Camila's plea to get Raquel canned, the guilt-stricken Pilar just can't bring herself to do it. Enter "Plan B": hiring a new maid to help take over some of Raquel's duties. It's a solution that doesn't sit so well with the suddenly possessive, territorial woman. But it turns into a delicious turn of events for the viewer as the agitated Raquel--armed with a vacuum, a bottle of bleach, an uncanny ability to channel her inner 2-year-old and a death stare that would halt the Grim Reaper--amps up her dark side, devising a series of plans to ouster her new competition. Her unknowing enemies include young, likeable Mercedes (Mercedes Villanueva), whose plans for the food antagonize Raquel ("She's got to understand! We're not in Peru! "); "cave woman" Sonia (Anita Reeves), a lifer who's wise to Raquel's schemes and seems more than ready to stand her ground ("Why do you make such an effort for those ingrates? Just do your job and you'll be happier! "); and jovial Lucy (Mariana Loyola), who tries to be upfront from the start: "Don't worry, I'm not staying in this house for the rest of my life...I'd die." Then there's the cat, another target of Raquel's anger (poor thing never saw it coming). In fact, no one is safe from her scorn--and no secret is safe (turns out Raquel might have more power than you expected). It's a credit to Silva and Saavedra that we're kept guessing and on our toes for so long. The Maid is a very quiet film--many of the sequences play out with minimal dialogue, and it's up to the leading actress to fill in the blanks with her face and body language. That she surpasses the challenge is all the more amazing considering the film requires her to spend most of its running time with a stone-cold face, one frozen in the same sad expression. We're left on our own to unravel Raquel's back story and motivation, but the actress does an incredible job of saying so much without any words--it's not as difficult to read her as you might initially think. Hey eyes, her mouth, her posture, her walk...all speak volumes about Raquel, and brief phone conversations with her mother clue us in to more issues. What do all of these silent moments say? That's something best left for viewers to uncover themselves. The Maid is funny, sad, sincere and scary all at once, and the less said about it, the better. It's a rare treat for a film to be this hard to categorize, and I'd ruin too much of its power by sharing what it ultimately offers. But I will share this: I had a handful of different ideas about where the film was going in my head, a bunch of endings all picked out. That it concluded in a manner I didn't anticipate was a big surprise, one that I hope you can also experience. As for that final shot? It's open to interpretation, one of the many beauties of this unique gem. Shot in high-definition with mostly roving handheld cameras, The Maid looks dull and dreary in its 1.78:1 anamorphic transfer...which I'm guessing is exactly how the director wanted it to look as it fits perfectly with the film's demeanor. There's no pop in the colors or visuals, and grain fills the screen. But you'll find detail here if you look for it. The Spanish-language track comes in 2.0 and 5.1 options, and the latter track has nice separation (voices from other rooms are often employed in important moments). There are also some nice touches with little sounds around the house, from clanking silverware and dishes, to the (ironic) bird chirping that frequently makes an appearance. Optional English subtitles are provided. The extras here give us just a small taste of what could have been a much more fulfilling collection. The bulk of content comes from the behind the scenes clips (21:10), mostly raw footage (a few contributors briefly address the camera) showing the cast and crew rehearsing and filming. It's an unstructured yet entertaining collection that shows how much fun everyone was having creating the film--the camaraderie is clear (the segment is divided into six sequences: the director, four actors and "The Last Laugh", although there isn't much differentiation between them). We briefly hear from Marisol Beltrán, the real-life inspiration for the Lucy character. 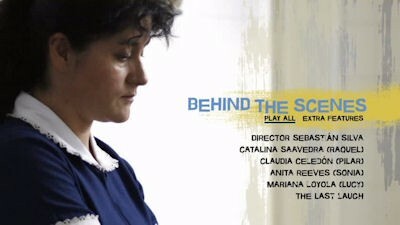 She gets emotional bonding with Mariana Loyola, and notes that the film brings back memories of things she went through. There's a much bigger story there, but we don't get to hear it. 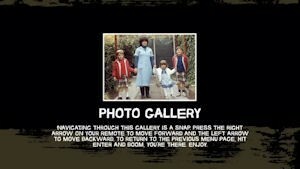 That also becomes clear in the short photo gallery, which includes a picture of the young director with his two siblings and the "real" Raquel. This is clearly a semi-autobiographical work, but we don't get to hear about any of its inspirations--a real shame, especially considering how funny, charismatic and engaging Sebastián Silva is in the behind-the-scenes footage. Also provided is the short and silent From Sketch to Screen: Storyboarding The Maid (3:03) and trailers for other Oscilloscope releases. The life of a disgruntled maid and a clash of societal class and culture are dissected in the delightfully uncomfortable La nana. There's a quiet confidence in the performance of Catalina Saavedra and director Sebastián Silva, who isn't afraid to let silence speak volumes. His actors enliven the story and fill the screen with their physical gifts, their eyes and faces providing a treasure of emotion. Frequently funny (for those of you with a slightly off-kilter sense of humor) and highly unpredictable, The Maid keeps you guessing about where it's going--and ultimately offers a surprising finish. Highly Recommended.